The Iwo Jima-class amphibious assault ships of the United States Navy were the first amphibious assault ships designed and built as dedicated helicopter carriers, capable of operating up to 20 helicopters to carry up to 1,800 marines ashore. They were named for battles featuring the United States Marine Corps, starting with the Battle of Iwo Jima. The first ship of the class was commissioned in 1961, and the last was decommissioned in 2002. Because these ships bore the hull classification of LPH they have often been referred to as "Landing Platform, Helicopter". One of the Iwo Jima class ships served as the fieldsite in Edwin Hutchins's classic cognitive science study Cognition in the Wild. 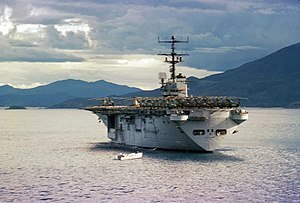 Although Hutchins does not mention the ship class by name, on p. 7 he characterizes it as a 603-foot-long (184 m) amphibious helicopter carrier. ^ Hutchins, Edwin (1995). Cognition in the Wild. MIT Press. This page was last edited on 13 December 2018, at 12:54 (UTC).